We are in the home stretch! It’s almost impossible to believe that I, and more importantly you for anyone reading, have made it this far. I thank you for your interest and patience and hope this series has been entertaining! Of course we’re not done yet. There is still one more entry before the final issue and the review of the current stable which, given what a long and diverse road it has been, should prove interesting. When we left off on the “his” side of the garage, the mighty GTR had been traded for something. I figured to give everyone a break from that traumatic shock I would focus on the wife’s car while we all cooled down. Hopefully we are all calm again and can explore what came next. I had mentioned that I really felt the GTR was too impractical, flashy and expensive to be my only car and I also felt it was just a bit lacking in intimacy and “driver involvement”. When I traded her in, I decided that really there is probably no car that can fill all of these bills and I still believe that to be true. What I decided to do is actually split the GTR into two cars. So while owning three cars was reasonably annoying, we decided that “his”, “hers”, “utility” was probably a good idea. I’ll cover “utility” in the final entry since it is still with us and focus on “his” for now since, shockingly, it isn’t. I was really missing a “proper sports car”, really missing stick shift and, honestly, really missing having a 911. With 996 values having been decimated by the IMS situation, and GTR values rock solid, selling off the GTR and getting both a little truck and a 911 seemed possible. I ended up selling the GTR for $59,000 on a dealer trade, which was really good value considering what I had paid and the fact that this value would completely neutralize the sales tax burden on the next purchase. Like the NSX this was nearly cost neutral driving. For the value minded, the Toyota Supra, NSX and GTR are definitely the cars if you want deprecation immunity! After a bit of searching, and in a bizarre case of coincidence, I found myself back at Brandywine Porsche (now renamed “Porsche of the Mainline”, but not for tax reasons… they swear!) It was surreal to return to that place because the last time I had been down there, as a diehard New Yorker venturing south and west to completely unknown territory, I might as well have been in West Virginia. I had no clue where the heck I was and no experience with the Philly suburbs. Now, after years of living in PA and “road warrioring” for VCE, that area has become extremely familiar. So familiar that it took me a moment to put two and two together. It seemed to ring a bell, but the name wasn’t recognizable and my memory of the place, being 10 years old with no context, didn’t quite match up. The “ah HA!” moment came when they put my info into the computer and asked “you’re not from Brooklyn are you?” Viva la CRM! Nice to see that their IT guys migrated the data cleanly over time 🙂 So what did I take home from Porsche this time? A near clone! Ah, there she is! Such a classic. 2002, manual trans Carrera 2. Options include power seats, supple leather, premium audio, aerokit and Porsche sport exhaust. What a sublime exhaust that is. I am in love with the PSE option and would call it a must buy for 911 shoppers. 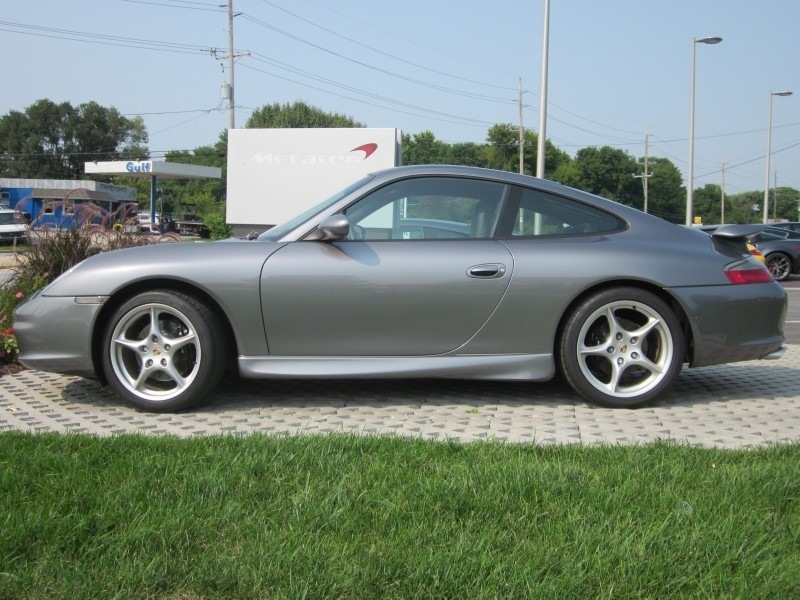 The finish was seal grey, the interior black and the cost $33,000 with 26,000 miles on the ODO. This was a keeper. Of course not my keeper (is anything?) but it is a keeper! I’m going to take a slightly different approach here. I have actually already compared and contrasted the two 996’s I’ve owned in these pages, so rather than reinvent this particular wheel, I’ll just link it as I think my thoughts there, and the comparison, still stand. What I’ll say instead is that I loved this car. The only reason it did not make it to the final entry of the series, the rundown of the current stable, is that in the end I decided that I needed something more practical and also, thought it only fair that if we were going to have 3 cars, they should all be interchangeable. My wife just can’t “do stick”, some of which is I am sure a lack of desire, and has always been concerned that in some sort of emergency she wouldn’t be able to move the car. Her nightmare scenario is both of us out one night, me being physically unable to drive, and her not being able to take over. Alright that’s not really such a nightmare in the grand scheme of things, but I do understand and appreciate the concern; it is valid. In addition, I found that I was driving “utility vehicle” a lot. And that was suboptimal. There really isn’t anything that explicitly prevents daily driving a 911 90% of the year; indeed almost no sports car (or GT coupe) is as “daily drivable” as the 911, and with 4 seats it actually walks up just about to the borderline of “practical”. No, this wasn’t a really objective thing, it was more of a psychological one. As I’ve mentioned before I am a decent manual trans driver, but it is something I enjoy for pleasure and not something I find pleasurable in any kind of hectic situation. I don’t drive all that much really, and if I am driving it is usually a quick drive out to grab lunch or run an errand, or hauling the family to one of our normal stops (shopping, supermarket, kid event, etc), or running out to a customer site for work. The 996 is not a good car for that first use case. If there is one thing about IMS that is true, it is that you can minimize the likelihood of experiencing an IMS failure by driving regularly, driving at high RPM, and driving long distances. Starting the car, driving it far enough that it doesn’t quite get fully warm, then shutting it down to run out for a minute is really not healthy for it. So I found myself either passing on the 911 on days where I couldn’t spare the time, or artificially elongating trips on days I could. That made for some nice drive time, but also added some decision making process to a something that is better without much thought (running an errand). Similarly, that last use case is often, quite honestly, a real pain. Driving down to Philly or out to NJ during business hours is a slog through stop and go traffic. For me, manual trans is just no fun in traffic so unless I was between hours, I would also forego using the 911 there as well. In the end, it just wasn’t being driven enough to justify its garage slot and, combined with the wife’s concern about not being able to drive it, that put it on the chopping block. Well, we’re here! The last entry. Next up will be the overview of the current stable and some final thoughts. Stay tuned!